"I don't really hear it ,I think people think they hear it. They've been told. He [Kurt Cobain]probably intended it as a friendly wink from one musician to another. That's all." Below is the complete list of every podcast in season 3. In addition to a description and tracklist, it is also possible to download the podcasts directly (i.e. without a podcast client) but not recommended. Simply right-click and save the MP3 (please don't stream if possible- it eats our bandwidth). We wrap up our 3rd season with the laziest of all shows - a clip show! Season 4 starts in October. This month, while not mocking beautiful speeches, we play the best independent releases from the Frank Black catalogue. 28 February 2008 - Where Is My Mind? A look at the music of Doug Sahm, whose song "Sunday Sunny Mill Valley Groove Day" (SSMVGD) has been covered by Frank Black numerous times and an interesting chat with his son, Shawn. We empty out the junk drawer and pull out all sorts of rarities and goodies. A tribute to the great Duane Jarvis, a year after his passing. Brian, sans Dean, navigates the new NonStopErotik and catches up with Black Francis and Eric Drew Feldman. Revisit the Catholics-era and take a look at how FB and the C's interpreted Pixies classics. 23 May 2002 - Where Is My Mind? Episode #41 - The Golem - Investigated! An exclusive listen to some of the tunes from the forthcoming The Golem album and limited edition box set. In addition, we chat with Eric Drew Feldman, Jason Carter and Ralph Carney about their roles on the album, AND a contest giveaway for the new Live in Nijmegen USB Clip! We take a look at the 20th anniversary of the Pixies' Doolittle as the Doolittle tour arrives in North America. Our collection of alternate versions include covers, live tracks, demos and more. After the sudden and unexpected loss of his wife, Mark Mulcahy was left alone to raise his two three-year old twins. To help him cope and continue to create music, some of his musical friends and fans, including Frank Black, have covered some of Mark's best work and put it together on a compilation CD. Our contribution is this lowly show playing some of his music and the songs from the tribute for your listening pleasure. This episode we look at the use of Frank Black's music in modern cinema, the melding of two classic mediums from cinematographers with exquisite taste. Episode #37 - Do the Duchy! Brian and Dean take a look at Grand Duchy's various works even as the band tours the world for the first time. Including two songs form their first-ever gig in Salem, Oregon, a few songs we can't skip, and a couple non-album tracks, this is the best way to pay your dues to the Duchy. 04-29-09 Salem, OR - Volcano! Spring is here in the northern hemisphere! Get out your skipping dopes, as Brian and Dean meander through the entire catalogue of Frank Black's music debating songs that are skip-worthy and insulting anything that moves you. Episode #35 - Dateless = Timeless? The latest in our series of delayed, late, and unscripted folly comes to your door after almost four months of haggling over broadcast rights and other excuses. Luckily, we get this Grand Duchy themed podcast to you now, only moments before the release of the first single, Lovesick, and just after the European release. Featuring a quick glance at the new Black Francis-Violet Clark project with a track from the Lovesick EP and all the usual trimmings, be sure to check it out. Who knows when the next one will come? OK, so it didn't come out on Halloween like we intended. It isn't really Halloween-themed in any way. And it is titled Boolated Halloween anyway because we're like that - and we couldn't help but use our artwork and show off our costumes. However, it is probably our favourite podcast in a month, featuring an Album Investigation of Bossanova, a trip down memory lane with one of our favourite exclusives, and Brian's favourite-ever fan-submitted song. Charles Normal, brother of Mr. Norman and collaborator of Frank Black. We also discuss some juicy news, play some great songs, and hopefully give our listeners an introduction to the music of Larry Norman. We would've been on time with our other podcasts but for many reasons they weren't. We're making it up to you with a complete recap on everything new in the Frank Black universe since last time. Also, some really great rare tracks, and debuting two new features and almost an hour of material. OK, so this time we mean it. We're back. Really. Dean is in Canada, Brian is in New Jersey, and the podcast is here every two weeks taking in-depth looks at old favourites and playing tracks you've never heard before. This time, a few tracks from Der Golem. This time, some pretty great live tracks. This time, a new format. Yes, we thought we'd try a video podcast to kick off the REAL Season 3, and we've got a music video, and some pretty cool tidbits about songs that show as they're playing. Enjoy! It's been almost a year, but the dynamic duo of Brian and Dean are back. 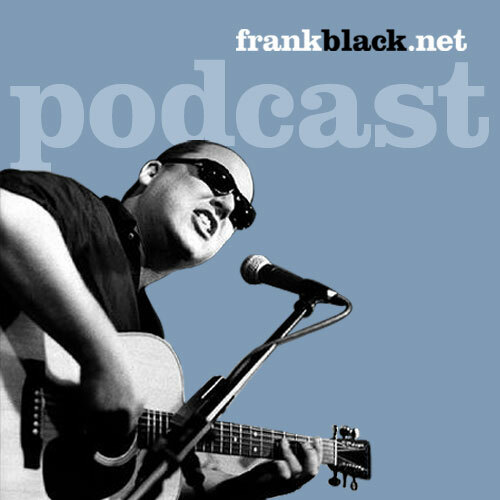 For how long is anybody's guess, but join us as we struggle to get you up to date with all the latest happenings in the Frank Black Francis universe and dish out the usual goodies, banter, and banality. And, did I mention, dabble in the world of Enhanced Podcasts. Let us know what you think!